Previous image, 21 total items. Next image, 21 total items. Expedia has some fantastic Valparaiso package deals Bundling your bookings is one of the simplest ways to save money and time — and get your journey off to a flying start. Wouldn't it be nice to save up to C$590*? Buy a package deal on Expedia now! With us, you've got more than 400 partner airlines and 321,000 worldwide properties to select from around the globe, which means your dream vacation is right there at your fingertips! You don't have to worry about altering your family's plans, as we don't charge additional cancellation fees for almost all of our bookings. About to go on your Valparaiso vacation? Wondering what sorts of things to put on your travel program? No need to stress — we'll give you some hints. A truly bucket-list attraction, the Casa Mirador de Lukas will knock your socks off. You won't have to go too far from your hotel to explore it if you decide to rest your head here in Valparaiso. You don't have to wander far to discover a way to keep yourself amused in this area. The Monumento de los Heroes de Iquique is a fabulous attraction that's within walking distance. Our planet is bursting with surprising plants, creatures and discoveries. An outing to Museo de Historia Natural will shine a light on the science of our natural world. There's a great range of things to keep you busy in this destination. It's not easy to see how people in the past survived at home without all the modernized equipment we have today. Step through the doorway of La Sebastiana Museum and find out how they did. Still got some time on your hands? Oh to be a fly on these walls! Just imagine the significant deals and heated conversations that have taken place at Congreso Nacional. Check for tours for a better look at this historically significant building. Embrace everything there is to see and do and go home with the best souvenir of all — memories of your extraordinary vacation! Got a little time on your side? Visit our Valparaiso things to do page for a full range of options. Sometimes, finding somewhere nice to stay is hard. Luckily, that isn't the case in Valparaiso. Here, you'll be able to select from as many as 44 properties. Expedia's the place to go for the best luxury getaways and cheap vacations. If you need to keep a close eye on your bank balance, why not look into low-cost accommodations like the Lemuria Hostel (San Enrique, 548) or the Hostel Adlafken (Calle San Enrique Nº 568, Cerro Alegre)? Both enjoy great reviews! On the other hand, we all deserve to treat ourselves sometimes. 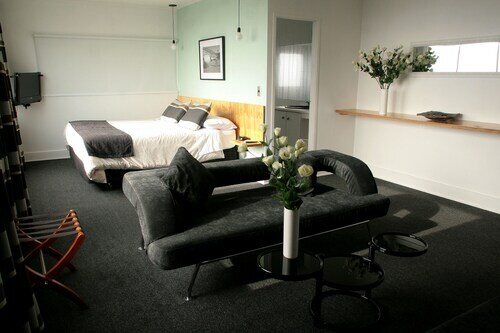 So, for a little opulence, the Zero Hotel (Lautaro Rosas 343) is a superb option. Alternatively, check out the amenities at the Hotel Palacio Astoreca (Calle Montealegre 149, Cerro Alegre). If you're eager to check out the Casa Mirador de Lukas and you want to stay nearby, you'll have some fantastic accommodations to pick from. The Hotel Terranostra is only 0.08 miles (0.13 km) away, and the Hotel Boutique Acontraluz is a mere 0.2 miles (0.3 km) away. Trying to discover how to make your way from Arturo Merino Benitez Airport (SCL) to Valparaiso? 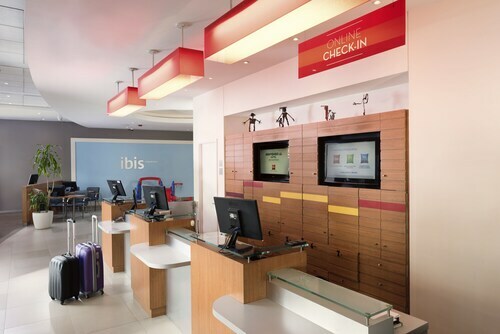 Once you've claimed your baggage, you'll be around 55 miles (89 km) southeast of the main streets. Home to architectural masterpieces, national monuments and port buildings, this lively square marks the heart of Valparaíso’s historic center. Visit this historic public square, which has an interesting collection of sculptures and is surrounded by colorful colonial-era buildings. Discover a vast collection of books and take a guided tour to learn about the history of this resplendent neoclassical building. Admire colonial-era mansions, browse artisan stalls and enjoy superb views over Valparaíso’s harbor from this picturesque hilltop street. Wander the winding streets of Cerro Bellavista to discover an open-air art gallery with 20 murals created by renowned artists and university students. 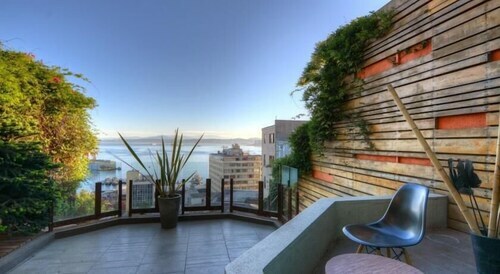 Situated in Valparaiso, this hotel is steps from Wallstreet Porteno, Turri Clock Tower, and Concepcion Lift. Monumento de los Heroes de Iquique and Prat Dock are also within 5 minutes. Puerto Station is only a 2-minute walk and Bellavista Station is 8 minutes. Located in the heart of Valparaiso, this hotel is within a 5-minute walk of Biblioteca Santiago Severin, Plaza Victoria, and Iglesia Catedral de Valparaiso. Museo de Historia Natural and Valparaiso University are also within 10 minutes. Bellavista Station is only a 4-minute walk and Francia Station is 8 minutes. 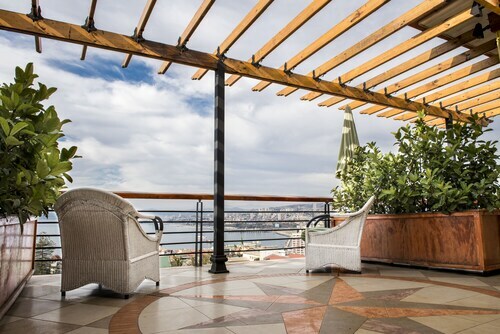 Situated by the ocean, this hotel is within a 10-minute walk of Mirador Paseo Gervasoni, Valparaiso University, and Reina Victoria Lift. Plaza Sotomayor and Port of Valparaiso are also within 1 mi (2 km). Bellavista Station is 10 minutes by foot and Puerto Station is 11 minutes. 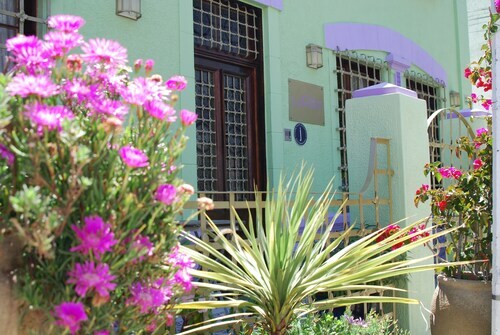 Located in Cerro Concepcion, this hotel is steps from Mirador Paseo Gervasoni and Turri Clock Tower. Fine Arts Museum and Reina Victoria Lift are also within 10 minutes. Puerto Station is 6 minutes by foot and Bellavista Station is 13 minutes. Situated in Valparaiso, this hotel is within a 10-minute walk of TeatroMuseo del Titere y el Payaso and Valparaiso Cultural Park. Reina Victoria Lift and Fine Arts Museum are also within 1 mi (2 km). Bellavista Station is 20 minutes by foot and Puerto Station is 22 minutes. 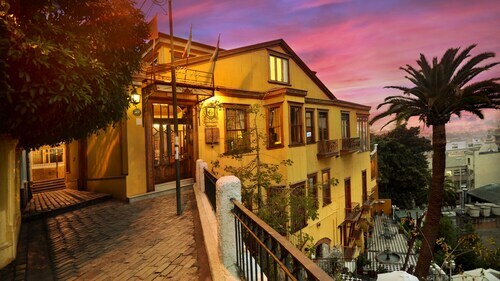 Located in Cerro Concepcion, this hotel is steps from Concepcion Lift, Casa Mirador de Lukas, and Mirador Paseo Gervasoni. Wallstreet Porteno and Turri Clock Tower are also within 10 minutes. Puerto Station is 7 minutes by foot and Bellavista Station is 12 minutes. Situated in the historical district, this hotel is within a 10-minute walk of Casa Mirador de Lukas, Mirador Paseo Gervasoni, and Reina Victoria Lift. Concepcion Lift and Fine Arts Museum are also within 10 minutes. Puerto Station is 10 minutes by foot and Bellavista Station is 15 minutes. Located in Cerro Concepcion, this hotel is steps from Concepcion Lift, Mirador Paseo Gervasoni, and Casa Mirador de Lukas. Turri Clock Tower and Wallstreet Porteno are also within 5 minutes. Puerto Station is 6 minutes by foot and Bellavista Station is 9 minutes.